Even though this blog is mostly focused on progressive rock in all its forms, I am, and always have been, a fan of good, old-fashioned hard rock. As much as I love the sophistication and intellectual appeal of prog, there is something about the powerful wail of a cranked-up electric guitar, or the equally powerful roar of an iron-lunged vocalist that appeals to both the physical and the emotional side of my nature. It is no wonder, then, to find an album like Black Sabbath’s Heaven and Hell in my personal Top 10 – and no wonder either that a band like Black Country Communion, in the ten months since the release of their debut album, has immediately become such a firm favourite that both their CDs get almost daily spins in our player. When the band’s formation was first announced, the presence of Glenn Hughes alone would have been enough to attract my interest, as he has been my favourite vocalist for the past ten years or so, even over such luminaries as Ronnie James Dio and Ian Gillan. The first time I saw him perform live, at London’s Mean Fiddler club in October 2003, as soon as he started to sing my jaw dropped on the floor and stayed there for the whole duration of the concert. I have also been following his career closely, and acquired quite a few of the numerous albums he has released over the years – including the near-legendary Hughes-Thrall album (originally released in 1982), and his collaborations with another rock legend, Black Sabbath guitarist Tony Iommi. However, nothing could have prepared me for the sheer magnificence that is Black Country Communion. Even though supergroups can often be rather hit-and-miss affairs that hardly ever last beyond one album, scuppered by ego clashes or by just failing to deliver the musical goods, BCC are all set to become the glaring exception to the rule. While snobs might superciliously label them as a retro or nostalgia act, accusing them of rehashing old modes of musical expression, or cashing in on some members’ erstwhile fame, in my humble view they possess the same classic, timeless quality of those dishes or items of clothing that never go out of fashion. There is something deeply comforting in the knowledge that, on a music scene all too often dominated by fads, where most of the offer seems to be little more than a triumph of style over substance, there are still artists that choose to play the music they want, and use the same strategies as the trailblazers of the late Sixties – writing brilliant material, releasing albums every few months or so (instead of keeping fans waiting for years), and – most importantly – performing their music on stage, where it really belongs. The sizable crowd was a mix of the older and the younger generations; some audience members had brought their children with them, as living proof of BCC’s timeless appeal – unlike, I am sorry to say, far too many stuck-in-a-time-warp progressive rock acts. I had noticed the same thing at the Blue Oyster Cult show in Baltimore, back in February – there is a reason why such bands are often called ‘classic rock’. When we got in, securing a nice position a few feet from the stage, the anticipation was palpable. At 8 p.m., the lights dimmed, and Wagner’s “Ride of the Valkyries” started blaring from the PA, eliciting a round of excited yells from the audience. A bit clichéd maybe, but a fitting introduction to one of the very best concerts I have been fortunate to attend. 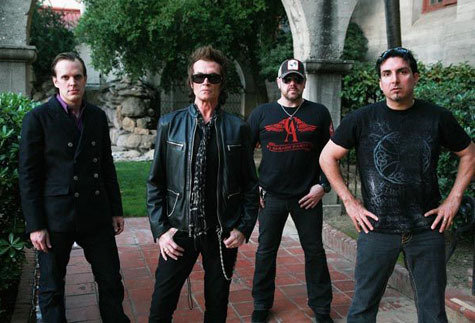 The concert was the last date of the band’s first US tour – expected, as Glenn Hughes repeated on several occasions, to ‘build a foundation’ for a band that aims to fill a void in the current music market – judging from the comments gathered around the Web, an unqualified success in spite of its short duration. With no opening act, the audience was allowed to concentrate completely on BCC’s show, introduced by the formidable one-two punch of “Black Country” and “One Last Soul” (from the band’s debut album). As expected, Glenn Hughes totally owned the stage, wielding a nicely battered, vintage red and white bass, and displaying a level of energy that many people half his age (he will turn 60 at the end of August) would kill for. As soon as he opened his mouth to belt out the first lines of the pulsating anthem “Black Country”, there was no doubt that he amply deserved his nickname of ‘The Voice of Rock”. Most of those who have been lucky to see him live will wonder how those golden pipes of his can withstand the strain of singing with that kind of intensity night after night. Though some people cannot warm to his voice, and are annoyed by what they perceive as over-the-top vocal acrobatics, I am happy to report that he has toned things down considerably, his voice adapting to the music rather than the other way around. Indeed, BCC is not a Glenn Hughes vehicle, but very much of a tight unit in which everyone works towards the final result. No one with a large ego would share vocal duties with someone as gifted as Joe Bonamassa (whose voice sounds at times like a higher-pitched version of Paul Rodgers). Glenn is also a fine lyricist, capable of penning standard rock anthems as well as deeply emotional pieces, such as the ones dealing with those dark years when he came very close to self-destruction. For somebody who has stared in the face of death, and lost many a good friend in recent years (including his childhood friend and fellow Trapeze member, Mel Galley), he is in superb shape, and his positive attitude to life is to be commended in an age when people seem to enjoy wallowing in negativity. He is also one of those rare singers whose voice has actually improved with age, in spite of his struggle with various addictions. While in his Trapeze and Deep Purple days Glenn’s voice had occasionally sounded a tad shrill, now it has acquired a depth and versatility that, coupled with his awesome range, allow him to sing just about anything with stunning results. Though they have been jokingly called “Purple Led” or “Deep Zeppelin”, BCC actually do not sound anything like Hughes’ former band. On the other hand, the Led Zeppelin comparisons are certainly more appropriate: Joe Bonamassa is the 21st century’s answer to Jimmy Page, and has also stepped into the void left by Gary Moore’s unexpected passing in February 2011. In a scene riddled with shredders, Bonamassa’s brilliantly emotional playing and considerable songwriting skills (as shown by “The Battle of Hadrian’s Wall” and “Song of Yesterday”, the latter possibly the highlight of the whole set) are a breath of fresh air, proving once again that great music does not necessarily have to break new ground each and every time. On stage he employed a nice array of guitars, including a double-necked one for the wistful, folk-tinged “The Battle for Hadrian’s Wall” (stirring memories of the immortal “The Battle of Evermore”), and a Flying V for the two encores – as well as a spot of Theremin towards the end of the set. Keyboard maestro Derek Sherinian plays an even larger role on stage than he does on record, putting to rest any allegations of BCC being a power trio with just a token helping of keyboards. His maple-encased Hammond B-3 provided that indispensable background rumble (though at times it tended to overwhelm the vocals); he also performed the only solo spot of the evening. Jason Bonham pounded away at his rather understated kit (especially if you are used to the likes of Mike Portnoy) with enthusiasm and precision – clearly a very capable drummer in the no-nonsense mould of his father or Cozy Powell, and perfectly suited to the band’s sound, which does not need fancy flourishes, but rather solid, powerful time-keeping. Until halfway through the set, both him and Sherinian looked dead serious, almost grim – but then both of their faces lit up when Hughes heaped lavish (and clearly heartfelt) praise on his fellow band members. The deep personal bond between the four players is clearly the secret to BCC’s success, and bodes very well for the band’s future endeavours. Besides 8 out of 11 tracks from the band’s second album (released only a few days before the gig), the stunning two-hour set featured a selection of songs from their debut, the gorgeous, slow-burning Bonamassa composition “The Ballad of John Henry” (from his 2009 album of the same title), and a blistering rendition of Deep Purple’s “Burn” as a final encore, with its iconic Hammond riff and Hughes screaming his heart out as he did almost 40 years ago at the legendary California Jam. Though I was a bit disappointed about the absence of personal favourites such as “Medusa” or “Down Again”, BCC’s performance was so exhilarating that it left no room for minor quibbles. In spite of the feeling of physical exhaustion and the ringing in our ears, we were left wanting more, and the promise of another US tour next year filled us with joy and anticipation. Clichéd as it may sound, Black Country Communion have really put the “super” back in “supergroup”. Long may they reign!